As Waukesha County employers continue to struggle with workforce development – 82% of Waukesha County employers are unable to find enough qualified workers – the Alliance is committed to working with other stakeholders to identify and implement solutions that address the shortage of affordable homes in Waukesha County, to provide more options for workers and young families. 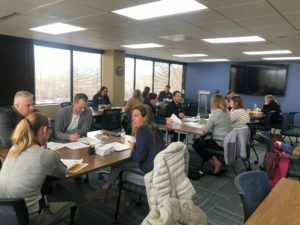 Participants were broken into groups to spend time working through “their” portion of the homebuilding process to see where costs could be removed, before coming back together as a group to discuss the feasibility and steps needed to implement the ideas that were brainstormed. In terms of next steps, the Task Force (comprised of industry leaders, the Waukesha County Executive’s office, the Waukesha County Business Alliance and the Waukesha County Center for Growth) will meet to debrief on the visioning session and prioritize the action items identified from participants.